JNN 21 April 2014 London : After three years of hard work, Nottingham’s long-awaited mosque was officially opened on Sunday where hundreds attended the first payer service at the religious center that aims to create a multicultural society in the East Midlands city. “This is one of the happiest days of my life because this is one of the best religious centers in Nottingham,” accountant Zamir Syed of Carlton told Nottingham Post. “Lots of people have worked day and night to make this possible. 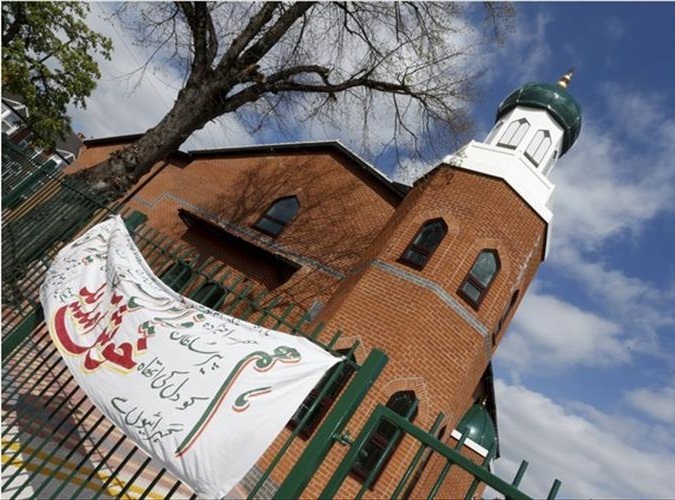 Nottingham’s first purpose-built mosque, Jamia Masjid Sultania, had taken three years to get finished with a 1.2-million-Euro budget after getting planning permissions from the City Council in 2011. Located in the village of Sneinton, the new mosque caters to nearly 800 worshippers. “This is the first time we will all come together for prayer here,” mosque chairman Aurangzeb Khan, 79, of Carlton, said after Sunday’s afternoon prayer that was attended by hundreds of Muslims. “It has taken three years to get it finished and more than £1 million. The mosque, which has been erected on the site of the former Jester pub, has the city’s first minaret. The 47ft high (14 metre) glass fibre minaret was added that the end of February as one of the final pieces to be added to the Jamia Masjid Sultania mosque, in Sneinton. Jamia Masjid Sultania aims to cater to the growing Muslim community that used to perform prayers in Thurgarton Street and hold meetings in the nearby houses over the past three decades. “This is a huge day for our community because we have needed a place like this for decades,” said Sajad Hamed, 36, a resident of Forest Fields. Along with the huge prayer area that caters to hundreds of worshippers, the mosque also includes an education centre. “It is really import for the younger community to have somewhere to go and learn,” member Tariq Mahmood of Bakersfield, said. Mahmood added that non-Muslims were welcomed to visit the mosque at anytime. “Anyone can come to the education centre and all the local people around are happy that we are here,” he said. For many Muslim residents of Sneinton, the mosque will offer a base for an ever-growing Muslim community. “It is a brilliant day and great to see the community out together,” businessman Khalid Mahmood of Sneinton said. “The mosque is a really great location for Bakersfield, Sneinton and The Meadows. Mosque members may apply to get permission for Adhan (The call to paryer), however they said that Adhan will not be raised in the early morning before sunrise at Fajr so as not to annoy people. “A lot of dedication has gone in to this and to giving Islam a good name,” Pharmacist Dr Alim Khan of Carlton said. This entry was posted in Europe and tagged Jamia Masjid Sultania, Nottingham, Sneinton. Bookmark the permalink.